Four years ago I traded in my Ford Ranger pickup, which had a cap on the back and a sleeping platform inside, for a Toyota Yaris hatchback. Sleeping inside my truck during climbing trips was easy and pretty comfortable. It was hot during the summer and itchy during bug season, but I could sleep anywhere. It's a little more difficult these days with a Toyota Yaris. 6-foot tall men can't easily sleep inside Toyota's small subcompact. Most years I spend around 50-70 nights on the ground, so having a comfortable camping set up is important. Sleeping in a claustrophobic backpacking/climbing tent at a car camping area during the humid east coast summer months is about as comfortable as going to the dentist to have a tooth drilled. A spacious well-ventilated tent is the key to comfortable car camping. If you've looked around at major manufacturer's tents you know that finding a tent that allows full cross-ventilation, even during heavy rain, is next to impossible. Marmot, REI, Big Agnes, Mountain Hardwear and all the other major tent manufacturers make tents with full-coverage rainflies. They're weatherproof, but they're also hot. If you're in West Virginia during a summer thunderstorm it's going to get moist inside the tent too because there's essentially no ventilation. Enter the $199 Eureka Sunrise 8. The Sunrise 8 is a no frills car camping tent that's comfortable enough for two people to live out of, or roomy enough to sleep 4 people reasonably well. An 8'x8' footprint, 2-pole dome design, and 5' high center with steep walls make this tent well suited for car camping. At 12 pounds It's not a backpacking tent, but it still easily fits in the back of my car. Stuffed dimensions are 25"x8". Two features make this tent stand head and shoulders above the rest. One is the durable Oxford polyester floor. The floor on the Sunrise 8 is made of heavier, more durable material than most other tents. You can set it anywhere, will never need a groundcloth on wet ground, and don't have to worry about your stuff getting wet or damaged. The real alchemy occurs in the windows though. There are four windows which can be almost entirely open during heavy rain. Each of the four walls, including the door, has a zip open window that covers a good portion of the wall, starting at the bathtub floor and ending near screen mesh at the top. The fly, which has two support poles, essentially creates awnings over each window. Even during heavy rain the the windows can be open. This means you never have to pull the fly on your tent when it starts raining in the middle of the night, only to become a sweaty mess inside. There are a few other nice features too. One large door, with full rainflaps makes entering and exiting the tent easy. A gear loft makes organizing small items simple too, and there are cupholders in the corners so you'll never spill beer inside the tent. The Achilles heel of this tent is the fiberglass poles. Fiberglass tent poles are cheaper than aluminum, so manufacturers like Eureka who aim their products at a mostly recreational crowd can offer a less expensive product. Several pole segments have splintered where they meet the aluminum sleeves at each end. Our fix has been to wrap the pole with a bit of duct tape and keep using it. It's not an elegant fix, but in five years of using this tent we've never had to replace a single pole. Our current dilemma is over whether we buy replacement poles (perhaps an aluminum replacement?) or replace the tent. After five years, and approximately 150-200 days of use, the tent doesn't have a single tear. The fly, which has lighter weight fabric than the rest of the tent, has one tear. We've not cleaned or maintained the tent at all and it still looks great. One other thing we've found is that if the floor is stretched out and staked too tightly the door is tough to close. Leaving the stake closest to the door a bit looser than the rest fixes this issue. If you're tired of sleeping in a backpacking tent at campgrounds or you're in the market for a functional, affordable car camping tent, take a look at the Sunrise 8. Not only is the ventilation amazing, at only $199, it's probably the best value around. Most climbing areas have a scene. In some places there are just a few climbers, and everyone knows everyone else. Other areas, like the Red River Gorge or the Gunks have large groups of local climbers and a weekend influx of "locals", climbers that frequent the area nearly every weekend. In places like this it becomes impossible to meet everyone else that's a climber. In the Gunks it's pretty difficult to be a dirtbag for long periods of time. This seems to have kept a large crowd of "young" climbers away from the area. When I first moved to the area I remember thinking there were so few other young climbers in the area. As time passed I began to meet many other climbers, some young, others a bit older. One of the most interesting local groups of climbers to watch has been a group of boulderers, many of whom have begun to trad climb. Bouldering has helped them get really strong, and they've taken their climbing skills and transferred it to harder traditional climbing. When you boulder V10 or harder climbing 5.12 starts to feel a little easier. 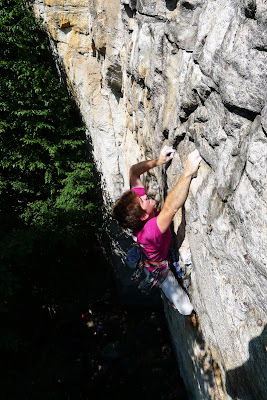 In early July I went out to Giants Workshop, a small but impressive crag between Skytop and the Trapps with a few of these hard-climbing Gunks locals. Giants Workshop only has a handful of routes but all of them are traditionally protected 5.12's and 5.13's. 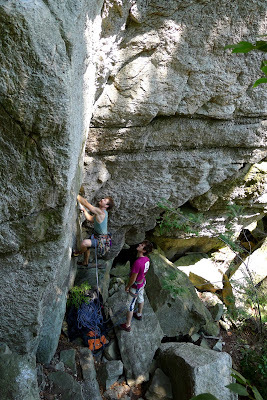 Here are a few photos of Andy Salo and Jesse Littleton, two young and very strong local Gunks climbers working, ground-up, on Projectile, a radically overhanging juggy route with a 12c endurance crux near the top. Jesse is working on the route still, and Andy sent it second go with preplaced gear. I have no doubt that by now he's sent Intruders (13a) and Toys for Tots (13a) there as well. For really awesome and funny footage of things this crew of climbers is doing check out Bass For Your Face. These guys don't take themselves too seriously. It's become one of my favorite East Coast climbing blogs. Or, in our case, the faster you run, the more you can climb. I just wrapped up a two week trip to the North Cascades. The last week was a whirlwind of approaching, climbing and descending with little to no rest between objectives. A solid forecast helped Bryan Ronan and I climb Mt. Shuksan, Mt. Triumph and do some multipitch cragging at Mt. Erie over the course of five consecutive days. Bryan, a natural athlete, began climbing in the Gunks with me two years ago. He's one of the lucky individuals I've met who's managed to find a balance in his life. He works full time, is a father of two, and manages to stay very fit. It seems he also used a July Cascades trip as a "carrot on a stick" for training purposes. Dawn on the Sulhpide Glacier, F2.2, 8 sec. The highlight of our trip was definitely a trip up the Northeast Ridge on Mt. Triumph, and down the South Ridge. This, combined with an approach from our camp at Thornton Lake and our descent to the trailhead at the end of the day made for a big day with lots of cross-country alpine travel. From our predawn start at 3:30 a.m. to our sweaty finish at the car in the dark at 9:30, this day was amazing. Triumph is a remote peak with views of some of the most rugged terrain in the lower 48 states. After some low clouds in the morning we enjoyed bright sun and clear skies all day long, making for an amazing day in the hills.